Being a large Italian island, set within the sparkling warm waters of the Mediterranean sea, it’s no surprise that Sardinia has miles upon miles of drop-dead-gorgeous coastlines, just begging to be traced by two feet and two wheels. The island is just brimming with pristine beaches, sheer cliffs, vivid blue waves and astonishing caves, perfect for us adventurous travellers to get our teeth stuck into. But, make sure you take the time to head further inland because you’ll discover a whole new world of fascinating nature reserves, trails and parks to explore, ideally suited for hiking and biking. 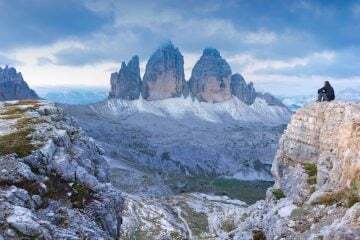 The Selvaggio Blu (Wild Blue, in English) trail, is known to be one of the most demanding multi-day hikes in Italy. However, the trail seems to have slipped under the adventure radar for many of us Brits. 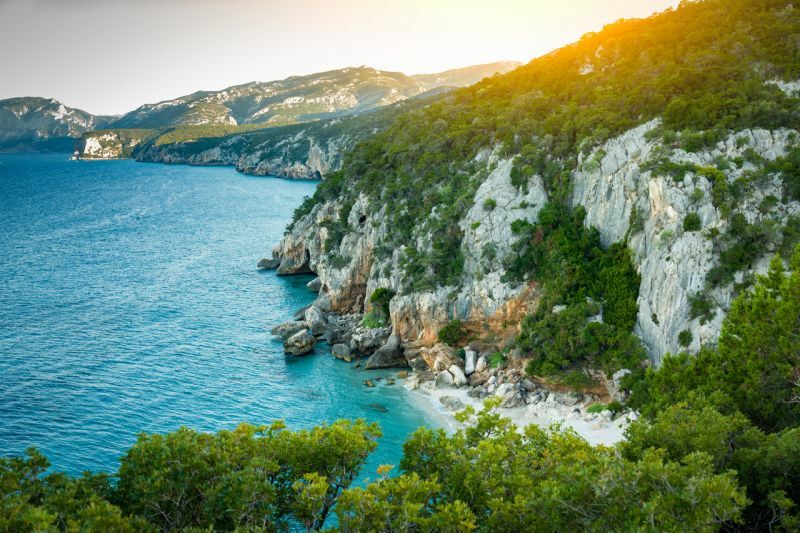 Often dubbed the secret classic, the approximately 25-mile-long trail traces the wild coastline of the Gulf of Orosei, which is on the east coast of Sardinia, and is said to be as much of a mountaineering adventure as it is a hike. 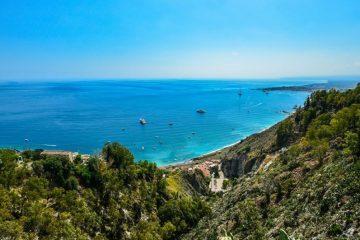 The route starts at Santa Maria Navarrese and traverses the top of the sheer white cliffs, soaring above the staggering blue Mediterranean Sea, and makes its way along to Cala Gonone. The trail is an exciting mixture of narrow footpaths, deep gorges, magnificent limestone cliffs (towering at over 800m), and isolated beaches. Although challenging, this route won’t let you down in the scenery department. The panoramic views are undeniably spectacular and are sure to etch an everlasting imprint on your memory. 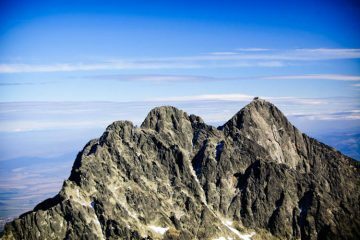 It’s suggested that hiking the trail will take between four and seven days, and some sections require scrambling, climbing or abseiling. It is advised to seek a local guide if you do not have experience with a trail of this level. 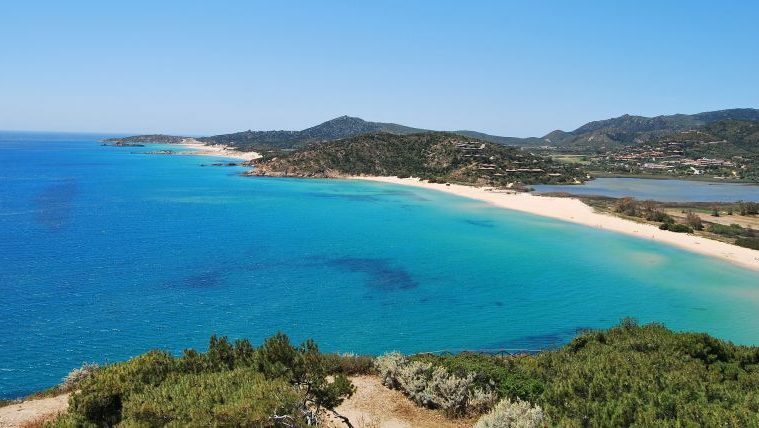 Sardinia is famous for its outstanding coastal beauty, but the island is actually mainly populated by a roller-coaster of rugged mountainous and lusciously hilly landscapes. 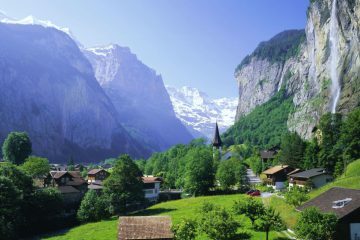 In fact, the island is home to peaks that soar well over 1,500m above sea level. 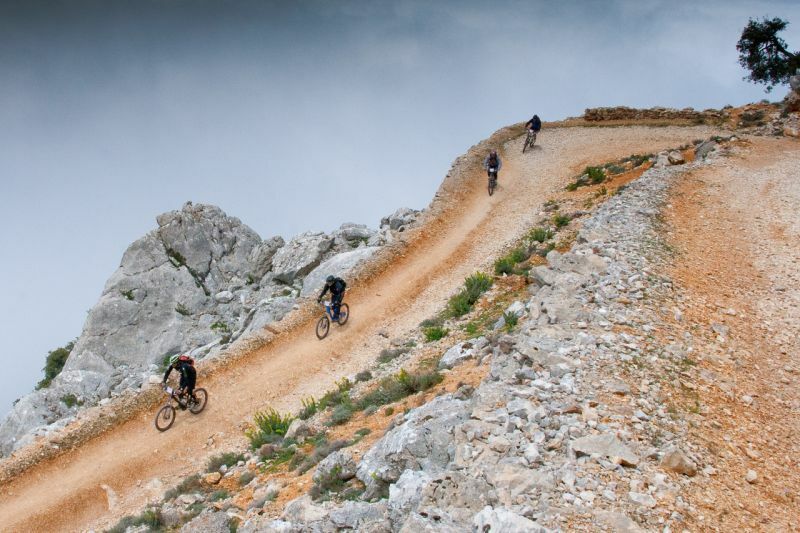 So, Sardinia is a fine choice for not only road cyclists who want to explore the breathtaking coastal roads, but for mountain bikers who want to taste the splendidly rocky mountain trails of central and southern Sardinia, which boast epic ocean views from the top. There is an abundance of granite hills, dirt tracks, green lanes, rocky single tracks and steep climbs to be explored in Sardinia, in fact, there are said to be around 70 options for bikers to choose from across the island. There are no trail centres or professionally maintained trail paths, however picking your route with a guidebook or simply with a map is a thing of ease, because there are no laws which prohibit mountain biking on footpaths. It’s suggested that the Isola di Sentieri paths offer some fantastic riding. The terrain is rocky and has some technical climbs and descents along historic shepherd tracks. 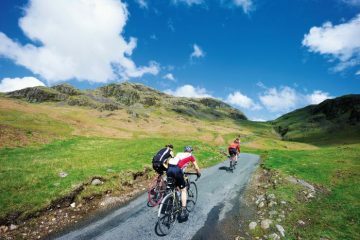 Whichever route you decide to take, you can be sure that you’ll experience some truly epic riding with beautiful views to boot. 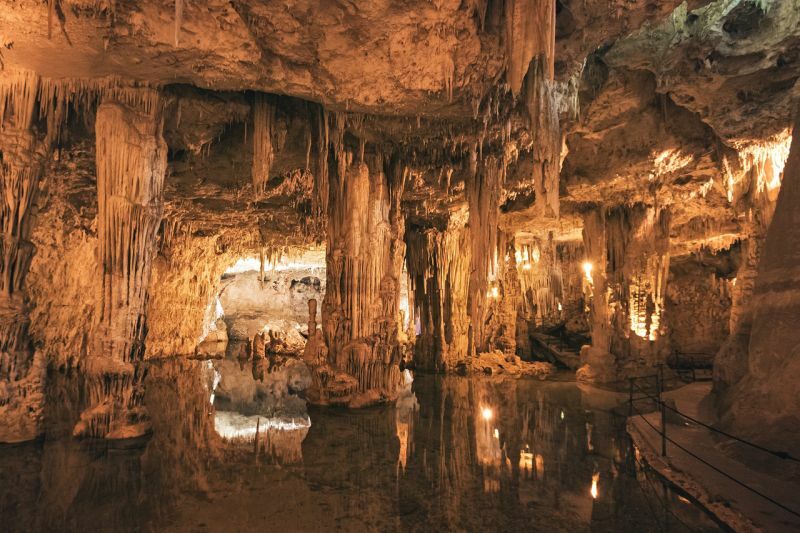 Head deep beneath Sardinia’s surface and lurking below you’ll find a hidden network of fascinating ancient caves, grottos and canyons. One of the most intriguing and beautiful among these spectacular caves systems is Grotto di Nettuno (Neptune’s Grotto). Local fishermen stumbled upon this cave in the 18th Century and aptly named it after the Roman god of the sea, Neptune. Just standing inside this remarkable cave is like being transported to a different planet, with its natural (but slightly alien looking) pillar-like formations which eerily reflect in the crystal clear waters of the lake that sits underneath. You can reach Grotto di Nettuno by either boat or foot from Alghero. However, an excellent way to add a little thrill and adventure to the trip is to access the cave from the top of Capo Cassia, a large vertical cliff, via the 656-step Escala del Cabirol (the Deer’s Staircase). The staircase weaves you gently down this magnificent rock face and offers some spectacular viewpoints along the way which look out over the stunning Mediterranean Sea. There are also many other grotto caves to check out in the area such as Grotta Verde, Grotta di Ispinigoli, and Grotta del Bel Marino. 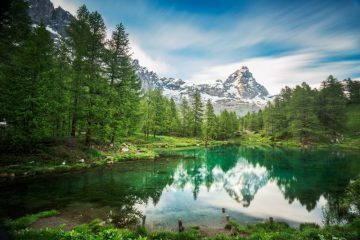 So, if you’ve got the time to spare, why not make a day of touring a few of these fantastic natural wonders? 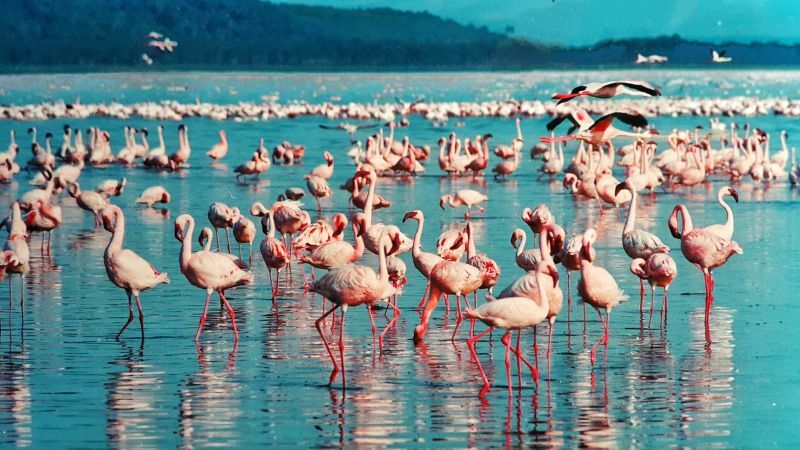 Sardinia is home to many wetlands and lagoons, which are the ideal resting place for the thousands of pink flamingos that stop-off to the island on their migration route between Europe and Africa each year. You can usually find them with their heads in the water searching for crustaceans to eat. Best place to spot the flamingos is at the Lagoon of San Teodoro. Get here: Alghero airport, Olbia airport, Cagliari airport. Eat this: Porcheddu -suckling pig (sorry vegetarians). Drink this: Mirto – a traditional liqueur.